We want to make it clear: if you think you're going to get into the futures market and get rich off of just a few contracts overnight, think again. This is a business just like any other, and therefore must be treated like a business. If you are patient and take the time to learn from several sources, and build on that knowledge, you can become a very successful trader. That's right, a trader, not just a person who sends his money to his broker and asks him to "invest" it. You will learn how to invest for yourself. By being conservative and taking profits as they present themselves, you can make great returns. Over time you can build a sizeable account just starting out with as little as $2,500. A lot of people have done it. If you learn the techniques and strategies and you are patient, you could do it too. It may take 5 years to make $100,000 in profits or ten years to make one million. Then again, you could do very well and it could take you less time. Just remember, making money in the futures market won't happen overnight. You will have to apply yourself, study the markets and charts, make a game plan and follow your plan consistently. You will also have to be conservative. It's a lot like a conventional retail business, where you learn all about the business, study the ins and outs and seasons, formulate a business plan, and open up for business. Once you start trading you should keep good accounting records so you can track your expenses, profits and losses. Tracking your trades can be done through accounting software, such as Quicken or a simple Excel spread sheet, this is important because you should be able to compare your records to your brokers statements It also helps you to calculate your overall returns. Try not to get greedy. Greedy people often lose out and don't profit at all. No one likes to study or have to figure out charts, formulate plans, and have patience and management right? Unlike other businesses that require licenses, employees, inventory, office space, salespeople and huge amounts of capital just to get started, commodities simply requires an understanding of the markets, a small amount of capital and a broker. There are, however, many benefits if you open your trading account in a business name or a corporation. The two major benefits are that you will take it more seriously and there can be some excellent tax benefits. A personal accountant will be able to help you with this. Get Inspired By The Most Popular Bloggers Online! 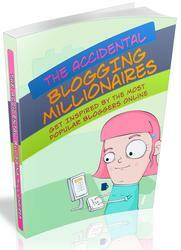 If You Want To Skyrocket Your Success With Business And Improve Your Overall Life You Need To Have A Look At The Accidental Blogging Millionaires! Business can be a fight, particularly when you’re trying to establish one online and like all fights, to succeed you must find the winning techniques and apply them.